Welcome to the Town of Ocean City’s Americans With Disabilities Website. Under the guidance of the Mayor and Council, the Ocean City Disabilities Advisory Committee is tasked with reporting and making recommendations relating to the implementation of the Americans With Disabilities Act. To promote quality of life, accessibility, and equity on behalf of all citizens and visitors to the Town of Ocean City, Maryland who experience disabilities. 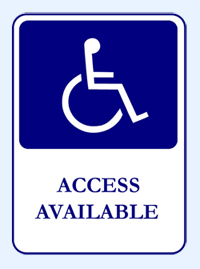 In order to accommodate our physically challenged patrons, a 30-minute grace period is in place. This allows those person(s) to view the ocean or pick-up an item from the boardwalk. In addition, there are handicap parking spaces located near the beach as well as the boardwalk just for these purposes. However, if the length of time spent in the parking lot is 31-minutes or more, the person will have to pay for the entire time spent in the parking lot, in accordance with the parking fees. ADA Playground at North Side Park at 125th St.
ADA accessible playground consists of both ground level and above ground level play elements with a bonded rubber safety surface. Park is open dawn to dusk. Origin to designation bus service for those meeting ADA eligibility requirements. To schedule one business day ahead, call the Department of Transportation at 410-723-1606. Access to the beach for the physically challenged is provided at certain locations along the beach and is designated by a blue sign on street entrances along Coastal Highway. Please be advised that beach wheelchair boxes are not located at every ADA beach access location. The following is a list of beach access locations. Somerset St. Talbot St. N. Division St.
1st St. 7th St. 12th St. 25th St.
27th St. 30th St. 35th St. 37th St.
40th St. 48th St. 59th St. 70th St.
81st St. 89th St. 94th St. 107th St.
120th St. 130th St. 139th St. 145th St. The Town of Ocean City is pleased to offer this benefit to its visitors in need of assistance traveling across the sand. Use of a city owned chair is a privilege, and we ask that you view it as such by abiding by a few simple guidelines established below. This free service is monitored by the Town’s Beach Patrol staff. Please remember that our Beach Patrol is here primarily to provide safety services to our beach-goers, therefore other beach-related responsibilities may cause a possible lengthy delay in staff attending to the distribution and collection of beach wheelchairs. Your patience is appreciated. For access to chair, to get a wheelchair box unlocked or to report damage or problems with a chair see a lifeguard or call 410-520-5231 10am – 4pm. Be prepared to show your driver’s license and complete wheelchair permit and waiver. Use chair only on beach/sand and within 1 block of the wheelchair box. Use at your own risk. Do not put chair in water. Do not inflate or deflate tire air pressure. Return beach wheelchair to lifeguard after transferring to another chair so that it may be available to others. Wheelchairs are first-come, first-served. Please share with others. A limited number of chairs may be reserved on a first-come, first-served basis. These special chairs are available for pick up at: Ocean City Visitor’s Center 410-289-2800. They will NOT be available at the Public Safety Building for the Summer of 2019 due to construction. The Town of Ocean City is pleased to help provide access to our beach for disabled visitors through the beach chair program. Donations to help purchase more chairs are gratefully accepted. Please make your check payable to Town of Ocean City and mail it to: Town of Ocean City, 301 Baltimore Avenue, Ocean City, MD 21842. Drop-boxes are located at City Hall on 3rd Street and the Recreation and Parks Community Center at Northside Park on 125th Street. 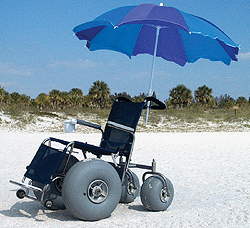 Please write “beach wheelchair donation” in the memo of your check. For more information call (410) 520-5403.